This set of two pin-up wall lamps from 360 Lighting is a pleasantly stylish choice for your home. 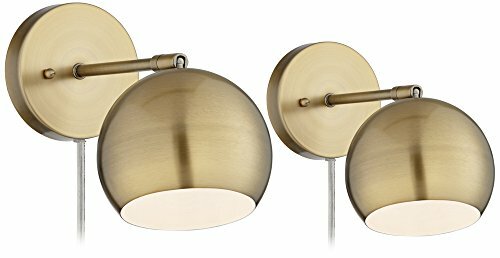 Each lamp comes in a warm antique brass finish and has a round sphere-shaped downlight shade that can be adjusted in all directions to change the focus of lighting. One 5-feet long clear silver cord and one a LED bulb are included with this set. - Set of 2 wall lamps. Each is 8 1/4" high x 5 3/4" wide. Extend 11" from the wall. Weighs 3.52 lbs. - Backplates are 5 1/4" wide x 1" deep. Shades is 5 3/4" wide x 5" high. Arm is 6 3/4" long. - Built-in non-dimmable 4 watt LED module per lamp. Comparable to a 40 watt incandescent. 480 lumens. 3000K. 80 CRI. - LED wall lamps from the 360 Lighting brand. Lights can be rotated-tilted left and right. Arm does not move. - Warm antique brass finish. Metal construction. 5-foot long clear silver cord. Cord cover is not included. - In-line on-off switch located on the cord. 10 1/2" from base to in-line switch. Set of 2 wall lamps. Each is 8 1/4" high x 5 3/4" wide. Extend 11" from the wall. Weighs 3.52 lbs. Backplates are 5 1/4" wide x 1" deep. Shades is 5 3/4" wide x 5" high. Arm is 6 3/4" long. Built-in non-dimmable 4 watt LED module per lamp. Comparable to a 40 watt incandescent. 480 lumens. 3000K. 80 CRI. LED wall lamps from the 360 Lighting brand. Lights can be rotated-tilted left and right. Arm does not move. Warm antique brass finish. Metal construction. 5-foot long clear silver cord. Cord cover is not included.